This is the 11th match of Global T20 Canada. The match will be played between Vancouver Knights (VK) & Edmonton Royals (ERO). Welcome to the Global T20 Canada. It is a franchise T20 tournament organized by Canada. There are 6 teams (five franchise teams – Edmonton Royals, Montreal Tigers, Toronto Nationals, Vancouver Knights, Winnipeg Hawks and one Windies B-team). There are many international players including Steve Smith & David Warner. The 21 Canadians, along with 11 other players from Associate Member nations, give Associate Member nations one-third of the total player pool (32 of 96), a higher proportion than the world’s other top professional Twenty20 leagues. Each team was required to have four Canadians on its roster and select two players from Associate Member nations. But there is no condition in the selection of Playing 11. We will provide information for all Global T20 Canada 2018match. And We will provide information for all Eglish T20 Blast also. Chris Gayle is looking out of touch but he can play big innings in any day. Chris Gayle will be lead Vancouver Knights (VK). Probably Chris Gayle & Evin Lewis will open for VK. Kevin O'Brien added to the squad. Christiaan Jonker, Asif Ali & C Lynn will not play in GT20 Canada. Edmonton Royals (ERO) added Farhaan Behardien, Andre Fletcher & Umar Akmal in place of them. Shahid Afridi will be lead Edmonton Royals (ERO). Probably Luke Ronchi & Andre Fletcher will open for Edmonton Royals (ERO). 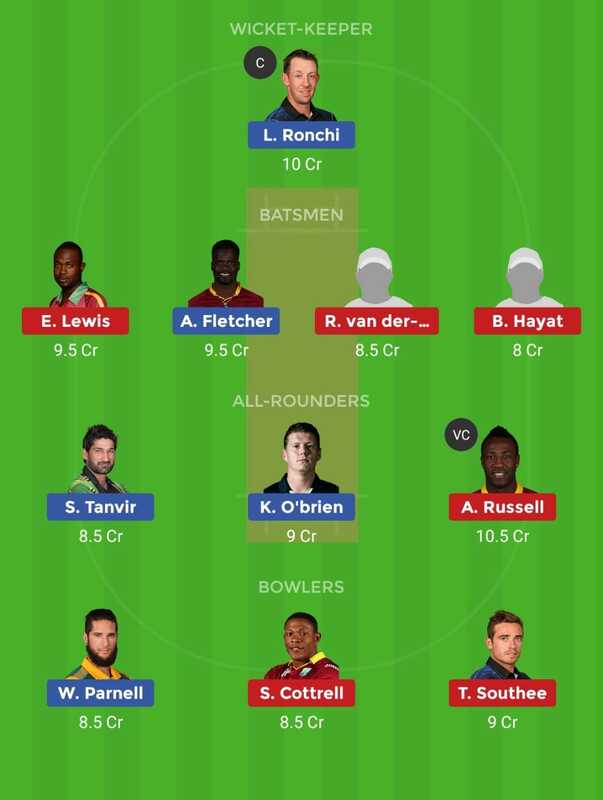 In WK Luke Ronchi is the best option. Chadwick Walton is also a good option. This match will be played at Maple Leaf North-West Ground, King City. The ground is small and the surface is likely to be batsman-friendly. But now it is helping the bowlers also.